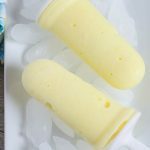 These Dole Whip Boozy Popsicles are the perfect grown-up frozen treats for hot summer days. In a blender, place frozen pineapple, milk, and rum. Blend well. Using a pop mold pour in the mixture and add the tops. Freeze overnight for best results.